Most people would say that the most special days of their lives are those on which a special occasion or festivity occurs; a wedding, a birthday, an anniversary, or maybe just an ordinary party which was special because of the people who were there – family and friends. What makes an event is often unclear, a special formula which happens only rarely. But there are a few things you can do which will make a big difference to the success of it, and one of those things is serving your guests extraordinary food – and here at Taste the Cracklin Hog Roast in Twickenham, that’s exactly what we do for all the good folks of Twickenham, for all their diverse events. We go the extra mile so that you can rest easy on your big day, knowing the food is going to be top notch. Before you make up your mind about us, let us reassure you that, even though hog roasts are our speciality, it’s by no means exhaustive of what we do. Here at Taste the Cracklin, we have long since branched out into not only spit-roasting all sorts of meats and joints, as well as perfecting barbecues, but also into creating complete and extensive menus for every occasion – from simple back garden parties to ornate sit-down dinners. Think of our hog roasts as our piece de resistance, it’s at the heart of what we do, but that doesn’t mean everything else is an afterthought; after all, what would a delicious hog roast be followed by sub-par starters be? That’s why our wonderful chefs have designed a large range of canapés, starters, mains, and desserts designed to compliment and give depth to our spit-roasted meats. Similarly, we are fully open to any suggestions and requests you may have for your own event? Got a special family dish you’d love to have included, or more practically, guests with special diets which need catering? There’s no issue there, our well-trained and polite office staff will liaise with you and our catering staff to ensure that everything is taken care of, and any new dishes which need to be included will be worked on and well-sourced with fresh ingredients, like everything we make. We pride ourselves on our ability to adapt to every and all scenarios. 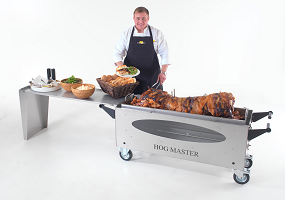 For instance, we bring our own marquees with us in case of inclement weather (alternatively, if there is an indoors to move into, our custom designed hog-roast machines are capable of being used in any well-ventilated space). We can provide waiting staff and cutlery for those venues which don’t provide their own. Above all, we never put a cap or a minimum limit on your number of guests; we have the experience and the know how to cater for any sized party, from ten people to ten thousand, we’ve seen it all. That’s just a few reasons why we think Taste the Cracklin Hog Roast in Twickenham is a top quality caterer, but to really find out for yourself, contact us soon to discuss your very own event.